Conventions and policies for biodiversity conservation and climate change mitigation state the need for increased protection, restoration and climate change adaptation of forests. Much degraded land may be targeted for large-scale forest restoration, yet challenges include costs, a shortage of regeneration material and the need for restored forests to serve as a resource for communities. To ensure ecosystem function for the future, forest restoration programs must: (1) learn from the past; (2) integrate ecological knowledge; (3) advance regeneration techniques and systems; (4) overcome biotic and abiotic disturbances and (5) adapt for future forest landscapes. Historical forest conditions, while site-specific, may help to identify the processes that leave long-term legacies in current forests and to understand tree migration biology/population dynamics and their relationship with climate change. Ecological theory around plant–plant interactions has shown the importance of negative (competition) and positive (facilitation) interactions for restoration, which will become more relevant with increasing drought due to climate change. Selective animal browsing influences plant–plant interactions and challenges restoration efforts to establish species-rich forests; an integrated approach is needed to simultaneously manage ungulate populations, landscape carrying capacity and browse-tolerant regeneration. A deeper understanding of limiting factors that affect plant establishment will facilitate nursery and site preparation systems to overcome inherent restoration challenges. Severe anthropogenic disturbances connected to global change have created unprecedented pressure on forests, necessitating novel ecological engineering, genetic conservation of tree species and landscape-level approaches that focus on creating functional ecosystems in a cost-effective manner. Forests around the globe provide a wide variety of ecosystem services. International conventions and national policies for biodiversity conservation and climate change mitigation state the need for increased forest protection, forest restoration and adaptation of forest management to climate change. However, global forest cover continues to decline. According to the last Forest Resources Assessment, the world’s forest area decreased by ca 3% between 1990 and 2015 (FAO 2018). Against this background, forest restoration activities have become increasingly common around the world and regeneration of trees is often a key component in these projects. Much degraded land may be targeted for forest restoration. In an analysis from 2011, the World Resource Institute suggested that ca 2 billion hectares of land is suitable for different kinds of forest restoration (Minnemayer et al. 2011; Silva et al. 2019). Several global, regional and national organizations have set targets during the last decade for large-scale forest landscape restoration. For example, the Great Green Wall of the Sahara and the Sahel Initiative in Africa aim to surround the region with vegetation, and China alone aims to plant 6.7 million hectares of forest per year (Cernansky 2018). The Bonn Challenge, started in 2011, aims to have 150 million hectares of degraded land in process of restoration by 2020, and 350 million hectares by 2030 according to the New York Declaration of 2014. Additionally, the UN REDD + program is attempting to encourage restoration of forests by creating a market value for the carbon stored therein (Jacobs et al. 2015). The United Nations recently recognized the critical role of ecosystem restoration as a tool for improving environmental conditions and enhancing human communities by designating 2021–2030 the UN Decade of Ecosystem Restoration (UN 2019). Restoration ambitions are high, and these initiatives have received much support from countries and organizations around the world. Successful large-scale restoration faces many challenges. First, the costs of achieving restoration are often high. A conservative estimate of 2000 $USD per hectare means that at least 700 billion $USD is required to restore 350 million hectares by 2030. This represents a significant barrier for scaling up restoration worldwide and there is a risk that the interest from policymakers will wane over time as the costs and difficulties becomes apparent (Löf 2017). 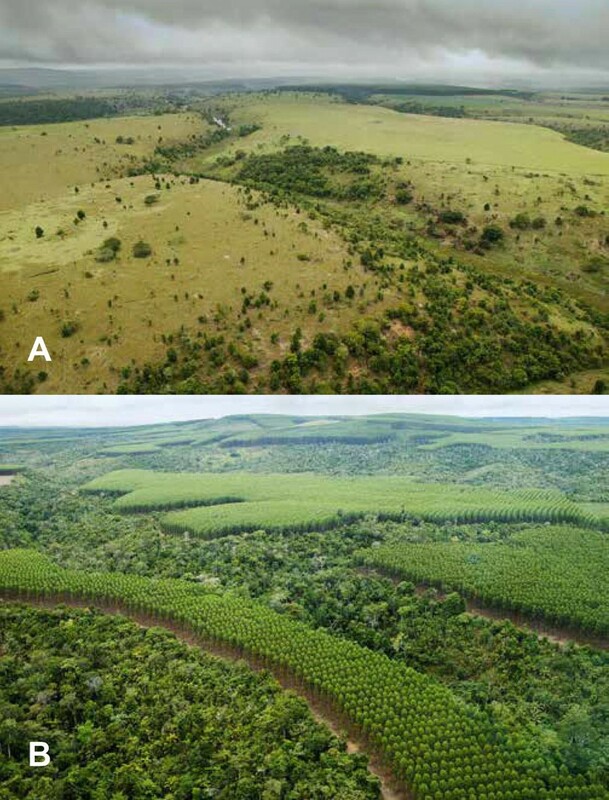 Restoration costs vary depending on methods used, from lower-cost alternatives using natural regeneration with native tree species to higher-cost approaches for active restoration using site preparation and planting. Recently, there has been a debate regarding advantages, disadvantages and the degree of success with these approaches (e.g. Crouzeilles et al. 2017; Meli et al. 2017; Reid et al. 2018) but no one-size-fits all solution regarding methods for restoration exists. Instead a broad palette of methods adapted to the local context needs to be utilized to accomplish the ambitious targets. Normally, costs for restoration increase with the degree of degradation of an ecosystem (Stanturf et al. 2001; Chazdon 2008) (Fig. 1). Thus, if appropriate seed sources are available, natural regeneration with native tree species may represent a cost-effective option that may be applied across large areas. In other cases, when no such seed sources exist or when sites are too harsh, active restoration using planting (sometimes with non-natives) is the only option to establish forests (Jacobs et al. 2015). Second, an important obstacle for successful active restoration is often a shortage of regeneration material (Cernansky 2018). Restoration projects involve the re-establishment of native tree species, but there is often little knowledge about how, where and when to obtain genetic material (species and provenances) with desired properties for the sites under restoration, and how to collect, store and pretreat seeds followed by cost-efficient cultivation of the seedlings in nurseries. In addition, we have little experience with establishing such regeneration; efficient regeneration systems currently exist for only a few tree species, mostly for use in industrial plantations and these techniques are not always suited for restoration programs (Löf et al. 2012). In addition, climate change raises questions about where different tree species may thrive in the future. Assisted migration, i.e. the human-assisted movement of plants or animals to more climatically suitable habitats, may be one way forward (Stanturf et al. 2014a, b; Dumroese et al. 2015). Much knowledge in this field is, however, still missing. The same can be said about how climate change will alter relationships among trees, insects and various diseases. A third major constraint for successful cost-effective restoration in the long term is that the restored forests needs to be a positive resource for the local and regional communities. Thus, forest restoration success depends much on people and their ability to utilize restored forests in different ways. The mounting demands from a growing human population increase the already huge pressure on the world’s natural resources. If society’s needs are not considered, the risk is that public interest to protect forests in a sustainable way will be insufficient. Multiple-use forestry, such as with multi-purpose mixed forest systems and agroforestry systems that provide food and other benefits for people, is therefore important. In addition, increasing evidence suggests that integrating exotic commercial tree species with native ones can support biodiversity, the environment and local economies. One such approach is the new generation plantation (NGP) Platform that was launched in 2007 (Silva et al. 2019). This concept aims to complement timber production with effective maintenance and enhancement of ecosystems, and simultaneously contribute to socio-economic development and climate change mitigation (Fig. 2). Plantations, with a current share of ca 7% of total global forests, can help to reduce pressure on natural forests (FAO 2010) as they contribute to ca 33% of global demand for industrial round wood, a demand that is predicted to increase (Silva et al. 2019). The NGP concept is one way to, at least partly, meet these growing demands. In September 2011, we held the 1st IUFRO Restoring Forests Congress in Madrid, Spain to address recent advances in forest restoration techniques and theory. 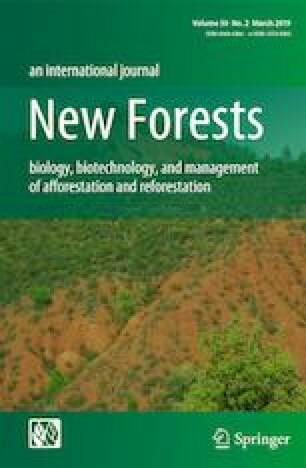 Selected papers from this symposium were published in New Forests (vol. 43, Issues 5–6). The 2nd IUFRO Restoring Forests Congress occurred in October 2014 in Indiana, USA and the corresponding Special Issue of this symposium was published in New Forests (vol. 46, Issues 5–6). To continue to communicate and advance upon emerging issues and themes in forest restoration, we held the 3rd IUFRO Restoring Forests Congress on 12–14 September 2017 in Lund, Sweden. The symposium was organized by the Swedish University of Agricultural Sciences and Southern Swedish Forest Research Centre, Estonian University of Life Sciences, University of Copenhagen and Purdue University, as well as IUFRO Divisions 1.01.00 (Temperate and Boreal Silviculture), 1.06.00 (Restoration of Degraded Sites), 2.01.15 (Whole Plant Physiology), and 1.01.06 (Ecology and Silviculture of Oak). A total of 109 scientists, representing 31 countries in five continents attended the Congress, which included 12 invited seminars, 38 offered oral presentations and 46 poster presentations. Field tours to Söderåsens National Park and Herrevads Monastery area highlighted ongoing research and management programs to promote forest restoration of broadleaves. The overall theme of the 3rd Congress was Restoring Forests—Regeneration and Ecosystem Function for the Future. The Congress was arranged according to the following five topics/sessions and within each topic, several key issues emerged (see below—Focal topics of the congress): (1) learning from the past; (2) ecological knowledge supporting forest restoration; (3) advances in restoration and regeneration techniques and systems; (4) forest restoration following biotic and abiotic disturbances; and (5) restoring forest landscapes for the future. The purpose of this international congress was to support this process by knowledge sharing and communication of the state-of-the-art in the research field of regeneration and forest restoration ecology. The Congress was arranged according to the following centralized topics, and within each topic, several key issues emerged. Scientists in restoration ecology continue to debate the usefulness of historical ecosystem conditions as targets and reference for practical restoration (e.g. Harris et al. 2006; Corlett 2016). An ecosystem condition is a response to past land use and past climate; restoring ecosystems is unlikely to be easy or even possible, especially under a rapidly changing climate. Even though historical conditions may, however, not always be useful as targets, research into long-term forest dynamics can support forest restoration in many ways. During this session, Richard Bradshaw listed three topics of major importance for restoration (Löf 2017). First, past historical forest conditions are often site-specific. Human pressure on forests may have varied much between sites and landscapes and, thus, restoration practitioners must be aware of this when defining any restoration targets. Second, through studies of the past we may identify the processes that leave long-term legacies in current forests (Johnstone et al. 2016; Jõgiste et al. 2017). Human impact through forest management and land-use patterns strongly influence current forest dynamics (Giesecke et al. 2017). For example, past forest fire regimes have been greatly altered by human activity; humans first greatly increased fire frequency and subsequently almost eradicated fire in parts of the world, therefore possibly influencing the fire regime to an extent that may be unprecedented for millennia (Krawchuk et al. 2009; Bradshaw and Sykes 2014). Similarities exist for past browsing and grazing regimes by both domestic animals and wild ungulates. Finally, understanding tree migration biology and population dynamics and their relationship with climate change is important. It can be very expensive for restoration practitioners trying to resist natural trends in forest dynamics. Restoration strategies should therefore look forward to solve future needs of society, but their success will be enhanced by looking backwards on information about the outcomes of past human impact, climate dynamics and forest response. During the last two decades, ecological theory concerning plant–plant interactions has developed with potential for great implications for cost-effective restoration (Löf 2017). In particular, it has been stressed that negative (competition) and positive (facilitation) interactions co-exist to a larger degree than previously thought (e.g. Bruno et al. 2003). Earlier, there was a strong focus on negative interactions, and still the most common vegetation management techniques during regeneration and restoration are measures that reduce competition from non-desired vegetation. Examples of such measures include prescribed fire, herbicides and mechanical site preparation. Concepts, such as the stress-gradient-hypothesis (e.g. Bertness and Callaway 1994; He et al. 2013) and nurse-plants (e.g. Gómez-Aparicio 2009) have, however, the potential to guide restoration toward methods that improve seedling survival and growth while simultaneously keeping restoration costs low. The former concept states that facilitation relative to competition increases in importance with the degree of abiotic and biotic stress, and the latter that one plant species can facilitate growth and development of another species. In addition, managing plant–plant interactions for restoration will be particularly relevant in scenarios of increasing drought due to climate change, with potential for an increasing role of facilitation to secure regeneration. However, these concepts have so far most frequently been applied to restoration in dry land ecosystems dominated by perennial herbs or shrubs (Gómez-Aparicio et al. 2004). Knowledge is still lacking for forest ecosystems where vegetation dynamics are more complex, i.e. temperate or tropical regions. To succeed, it is not only necessary to select good combinations of nurse- and target-tree species with complementary species traits, but also to manage plant densities and community composition as plant cover and competition increase with time. Direct or indirect biotic interactions involving herbivores may also play a fundamental role for cost-effective forest restoration. High deer populations in Europe and North America, for example, pose one of the greatest challenges to the forest regeneration of many plant species, which further affects species composition, forest structure and function (e.g. Côté et al. 2004). Selective ungulate browsing influences plant–plant interactions to such an extent that browse-tolerant or less palatable tree species often are favored and, thus, challenge restoration efforts to establish more species-rich forests (Kuijper et al. 2010; Metslaid et al. 2013). Physical or chemical protection of regeneration by fences, repellents or individual tree shelters is usually effective, but the costs of establishing, maintaining and removing these measures are high. Low-cost strategies may include providing physical protection for the target trees by using dense natural regeneration, direct seeding of species that are more browse tolerant or using nurse trees/shrubs. Ungulate impact can also be lessened by reducing the populations (by hunting), increasing the forest landscape carrying capacity (more food for the deer) or combining these two approaches. In addition, fodder crops of grasses, herbs or woody species, may be established to release browsing pressure from more desired species on restoration sites; and supplementary feeding might be an option if this food improves nutrition of the ungulate (Felton et al. 2016). However, it may be difficult to translate new research findings about low-cost browsing-tolerant regeneration alternatives to restoration practice. An integrated approach is needed that simultaneously manages populations of deer, landscape carrying capacity and browsing-tolerant regeneration, which requires good cooperation among various stakeholders. 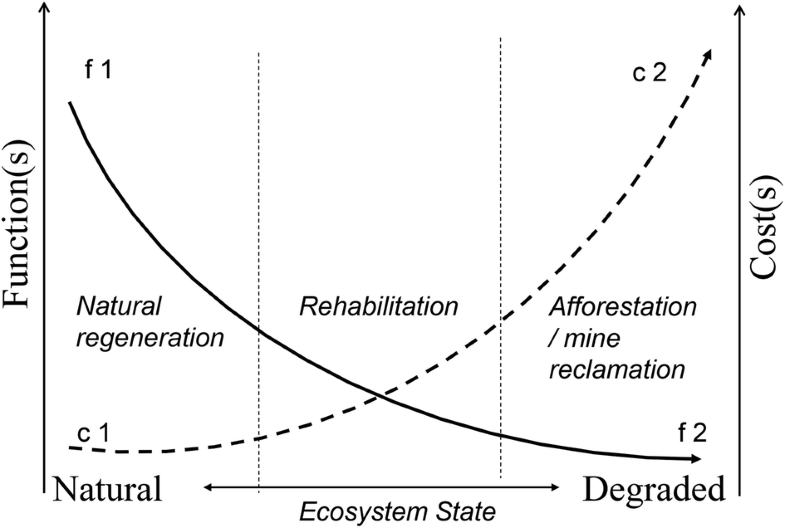 Forest restoration and regeneration practices must continuously adapt to meet changing needs of society, human and natural disturbances, policies, markets, technologies and climate (Wagner et al. 2018). Much of the past science in this area emphasized reforestation following timber harvest for industrial purposes, but an increasing focus on restoration of harsh, degraded environments demands new seedling production and planting techniques (Oliet and Jacobs 2012). Improved understanding of biotic and abiotic factors that affect ecophysiology of plant establishment is required to overcome inherent challenges on restoration sites. Nursery systems aim to produce high quality, stress resistant planting stock that will withstand stresses following field establishment (Haase and Davis 2017). Stocktypes, fertilization or irrigation regimes and hardening practices can be manipulated in the nursery to tailor morphological and physiological seedling attributes to optimize performance under the conditions of a given outplanting site (Grossnickle and El-Kassaby 2015; Dumroese et al. 2016). Seedling size is positively correlated with plant content of nitrogen and carbohydrates and seedlings may remobilize these stored reserves in order to resist environmental stresses on the planting site (Villar-Salvador et al. 2015; Uscola et al. 2015). Thus, while a shift away from planting older and larger seedlings toward younger and smaller seedlings has occurred in some boreal regions (Löf 2017), the opposite trend prevails for restoration under harsh, dry site conditions, such as in Mediterranean regions (Villar-Salvador et al. 2012). Site preparation is often necessary on restoration sites to ensure natural or artificial regeneration success, with requirements often dependent upon severity of prior disturbance. For instance, severe landscape disturbance associated with mine reclamation may require novel innovations in geomorphic restoration and site reconstruction (MacDonald et al. 2015; Zapico et al. 2018) to ensure functioning soil. Technological advances of mechanical site preparation have improved the efficiency of control of site limiting factors (i.e. target vegetation, compaction, mounding), costs, environmental impact and worker safety (Löf et al. 2012; Löf 2017). Continued enhancements in application of field fertilization, soil amendments and tree shelters (Earnshaw et al. 2016; Löf 2017; Oliet et al. 2019) will further promote regeneration and restoration success. While fencing is generally effective against ungulate damage, the high cost of installation and maintenance limits its practical use. Thus, continued evaluation of alternatives such tree shelters, nurse plants and silvicultural planting schemes that account for browse risk (Owings et al. 2017; Burney and Jacobs 2018; Maltoni et al. 2019) will help to ensure cost-effective restoration. Disturbances are an essential part of forest ecosystems. Ecological processes that lead to stand structural complexity are in fact dependent upon natural disturbances (Löf 2017), which may include windthrow, forest fire and pest or disease outbreaks. Although the economics of fiber production is the main driver of management in commercial forests, there are opportunities to use alternative forestry methods, such as retention trees, variable density thinning and prescribed burning that mimic natural disturbances to promote heterogeneous forest stand structure and biodiversity (Puettmann et al. 2016; Löf 2017). Degradation and loss of forests due to anthropogenic disturbances, however, have resulted in a significant reduction of forest biodiversity and the need for restoration of millions of hectares of degraded forests worldwide (Lindenmayer 2019). In degraded environments, such as with grazing lands, abandoned crop lands or following severe wildfire, structural elements and sources of microsite diversity are often limited (Cortina et al. 2011), adding to restoration challenges. Mining sites are particularly difficult to restore to functioning forest ecosystems because of the need for massive landscape-level reconstruction of soils, hydrology and biota, as well as the associated forest fragmentation, erosion and disposal of mine tailing wastes (Stanturf et al. 2014a, b; Macdonald et al. 2015). Simultaneously, global change, including an exponential increase in the introduction of invasive species and a rapidly shifting climate puts unprecedented pressure on forests (Martín et al. 2013; Dumroese et al. 2015). The number of threatened and endangered forest tree species continues to rise, and the practical restoration of such species is complex due to the need for effective integration of technology, ecology and society (Jacobs et al. 2013). Thus, the genetic conservation of tree species has become an urgent global necessity as this provides the essential basis for the adaptation and resilience of tree species to environmental stress and change (Potter et al. 2017). While knowledge of historical species range distributions can help to guide restoration targets (Dalgleish et al. 2015), shifts in frost hardiness zones, drought severity indices and presence or absence of species competitors will drive species regional adaptiveness in the future. We are still in the infancy of navigating these dynamic and critical issues that will have long-lasting consequences for success of forest restoration programs. In addition to goals for mitigating climate change and improving local economies, restoration provides great hope that biodiversity losses can be minimized and sometimes reversed. However, there is a polarized debate among conservation, forest management and restoration in relation to, e.g. non-native species and novel ecosystems, but also any need for continued management (Hobbs 2013). This debate will proceed even though all disciplines will be transformed in order to address rapid climate change both from theoretical- and practical perspectives (e.g. Colloff et al. 2017; Spathelf et al. 2018). The traditional use of past ecosystems as targets and criteria for success will probably be replaced over time by an increased orientation towards an uncertain future. Conflicts are sometimes rooted in discrepancies regarding definitions of concepts, and in other cases concepts are context-dependent (Corlett 2016). For example, retention approaches at final harvest, whereby individual trees, tree patches and dead wood are left on a site with a primary aim to promote biodiversity (Löf 2017), were introduced a few decades ago on several continents. Retention can be seen as a conservation action, as natural forest elements are saved for the future (in a forest landscape previously not much affected by humans). But it can also be seen as restoration because it creates structurally richer stands (in a forest landscape that has been homogenized by human operations, i.e. clearcutting and plantation forestry). Other practices, such as forest enrichment by underplanting, contribute to enhance structural complexity of managed forests yet their effectiveness is dependent upon choice of thinning intensity and underplanted species attributes (Gavinet et al. 2016; Lesko and Jacobs 2018; Lu et al. 2018). Because several disciplines are involved in the discussion, any attempts to formulate a universal definition of restoration will continue to generate discussion (Mansourian 2018; Stanturf et al. 2014a, b). Large areas require forest restoration and so landscape-level approaches that focus on functional ecosystems, rather than historical conditions in small areas, may be most cost-effective (Stanturf et al. 2014a, b; Perring et al. 2015). In addition, a need to broaden the scope of forest restoration, from the site and stand level to the landscape level, is often required (Gustafson et al. 2018). Otherwise it will be difficult to accommodate diverse objectives from multiple owners and incorporate livelihood needs. The concept of New Generation Plantations (Silva et al. 2019) is one promising way forward, but such multi-purpose approaches create new challenges for research and management. While our understanding of mixed forest systems has increased over the last decades, the formulation of silvicultural and restoration guidelines for practical management of more complex forest stands and landscapes is lacking in many cases (Coll et al. 2018). Thus, despite ambitious goals and governmental funding initiatives for restoration including native tree species, such stands may not receive timely thinning treatments for sustained timber production or sustained compositional diversity. A total of 12 original research or review articles covering a wide range of issues in forest restoration are included in this Special Issue and some of these are highlighted here. In accordance with his inaugural address from the Congress, Luis Neves Silva describes the potential for new generation plantations (NGP) to conserve natural forests and biodiversity, while also providing timber and helping to mitigate climate change (Silva et al. 2019). Approximately 11.1 million hectares of land are being managed as NGP, which results in economic return while contributing positively to ecosystems and socio-economic development. David Lindenmayer’s inaugural address detailed how the case study of Eucalyptus regnans in southeastern Australia can be applied toward four guiding principles that strategically help to conserve biodiversity and accomplish effective forest restoration. These general principles focus on key species and their habitats, attributes of stand structure, landscape heterogeneity and ecological processes (Lindenmayer 2019). Addressing the theme of Ecological Knowledge Supporting Forest Restoration, Merlin et al. (2019) report results of an experiment conducted in the boreal forests of northern Alberta, Canada on a site that was heavily reconstructed following oil sands mining. They demonstrated the importance of physical and chemical properties of the reconstructed soils as determinants of the performance of planted boreal tree species and how limiting factors to seedling performance may vary by species and shift over time. It is well known that granivorous rodents are a major threat to successful regeneration of broadleaves. To help identify control mechanisms, Villalobos et al. (2019) demonstrated that repellents may help to reduce predation of oak acorns and beech nuts by voles. Meta-analyses provide an important tool to identify generalized trends across research studies globally. In seedling quality and field performance research, however, about one-third of publications cannot be used for such purposes due a lack of methodological details and statistical results. Andivia et al. (2019) present guidelines for improving article presentation so that future research can be more readily incorporated into such meta-analyses. Oliet et al. (2019) contributed toward the session on Advances in Restoration and Regeneration Techniques and Systems. Tree shelters are commonly used as a means to improve survival of planted seedlings in Mediterranean restoration systems, but the eco-physiological mechanisms for species differences are not well understood. By examining solid versus mesh wall tubes that vary in light transmissivity, they concluded that microclimatic factors may primarily drive responses. Juan A. Martín delivered an invited presentation to launch the session titled Forest Restoration Following Biotic and Abiotic Disturbances. Through traditional hybridization and selection of native clones, significant progress has been made toward restoration of European elms that were devastated by Dutch elm disease (Martín et al. 2019). The researchers recognized the importance of improving knowledge in elm ecology and society’s acceptance of disease resistant hybrid elms in order for such species restoration to be successful, similar to the case of American chestnut in the US (Jacobs et al. 2013). As also presented in this session, Anderson et al. (2019) describe accumulation of soil organic matter under re-vegetation treatments following oil sands reclamation in northern Alberta, Canada. They linked treatment differences to varying macro-faunal activity and suggested that planting of aspen would result in more rapid carbon sequestration through soil organic matter accumulation. Berg et al. (2019) studied advance regeneration responses in forest gaps over a 20-year period following hurricane disturbance in the central Appalachian Mountains region of the US. They observed strong temporal variation in tree survival associated with distance from gap center, with survivorship increasing from gap center to forest edge during the first half of the study, and the opposite trend by the end of the experiment. Contributing to the theme of Restoring Forest Landscapes of the Future, Riccioli et al. (2019) evaluated the willingness to pay for restoration management to maintain the recreational values of forests. Forest users preferred the use of management leading to high forests versus natural evolution, suggesting the increasing importance of recreational value toward motivating forest restoration in the future. In conclusion, we recognized the importance of continued commitment to multidisciplinary, global collaboration in forest restoration research. Regular gatherings through symposia were identified as an instrumental tool in exchange of experiences and research information, and it was decided that the 4th IUFRO Restoring Forests would be held during 2020 in Chile. We are most grateful to all authors of this Special Issue of the 3rd IUFRO Restoring Forests Congress, and for support from The Swedish Research Council for Sustainable Development, EFINORD-SNS Nordic Network of Forest Regeneration, and grant IUT21-4 from the Estonian Ministry of Education and Research. We appreciate constructive comments from three reviewers on this manuscript.